A few years ago, we met up with Mitab to discuss how they could take their passion for developing products for public spaces to the next level. It was time to broaden their product range and introduce it to a wider, global audience. Using our knack for tackling complex projects, we decided to develop an innovative, modern seating solution for people on the go. Expanding their existing portfolio – while at the same time going global – was a big step. We needed to make a statement, while staying true to Mitab’s core values. We decided to create an innovative modular seating system, adaptable to a variety of public spaces and capable of dealing with heavy wear and tear. Maintenance had to be smooth and simple, with removable seats for quick repairs. To get a good idea of the tough requirements of different public spaces, we started off with a series of user studies, while also taking a look at what was already out there. Traditional beam sofa systems basically meant attaching a row of seats to a horizontal beam. Which was fine – but we wanted to do things a little differently. Our aim was to create a unique, integrated design with an iconic look. Something that went beyond the mainstream, while staying simple and functional. A clean, modern design that wouldn’t feel dated in a couple of years. Transfer is a clean, smart solution, based o an integrated aluminum beam that forms the center of the seat, back and legs. With its modular design, it can be customised to fit virtually any public space, big or small. Graphically modern, Transfer’s distinctive character contrasts visual lightness with solidity and weight. We are proud to have helped Mitab bring a fresh dose of cool, functional design to new markets. Sleek lines and graphic angles create a clean, cool impression, without compromising on functionality. Two seats or four? Armrests, table top, phone chargers, handicap seats? Transfer offers great versatility, making it an ideal solution for all kinds of public environments. 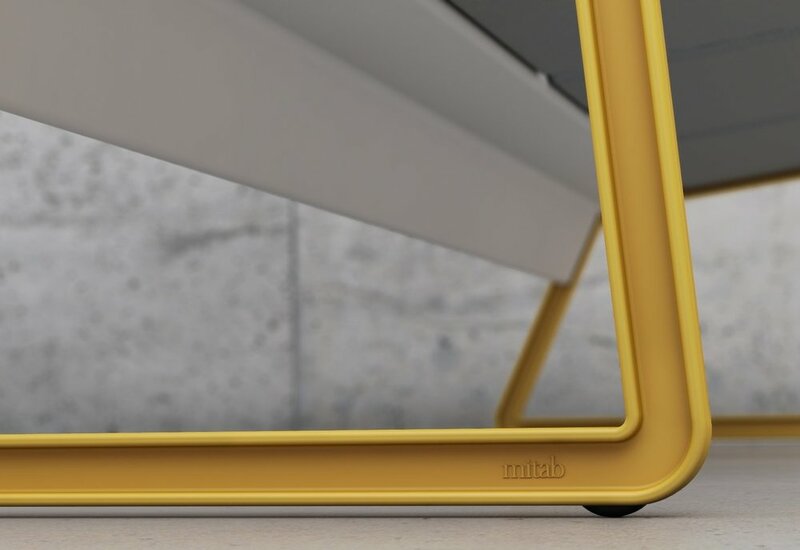 In close cooperation with creative, curious designers, Mitab creates furniture for pause and interaction in public spaces. Founded in 1979 by Jan-Olof Torstensson, Mitab is now run by his sons Peter and Marcus, who aim for a high level of design consistency and ambition.